M&S: don't cut staff pay! Save The White Lion, Mitcham! Keep Mitcham & Morden Together! Keep the Wilson Hospital GP & Walk-In Services open! There are too many unfair letting fees, a lack of transparency within the housing market and not enough affordable housing. Housing is one of the biggest issues Siobhain cares about. It is also the most common case brought up to Siobhain by her constituents at her weekly advice surgery. The Queen’s Speech after the recent General Election indicated that there may be a ban on private letting fees. While Siobhain absolutely welcomes this, it is just one of the many issues faced by the private rented sector. The cost of private rent has already risen by 22% since 2010, leading housing benefits going to private rents doubling in the last 10 years alone. And level of home ownership is at its lowest in Britain since 1985. 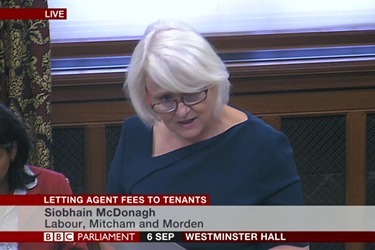 In her speech, Siobhain raises the astounding £1250 fee her constituent David was charged as an example to showcase the severity of fees faced by so many people. Letting fees must be banned, but this is just the beginning if the vast array of problems in the private rented sector are to be solved. © Copyright 2019 Siobhain McDonagh MP. All Rights Reserved.